NEW HAVEN, Conn. -- The number of overdose victims linked to a suspected bad batch of synthetic marijuana has risen to at least 76 in New Haven, Connecticut, as officials try to determine exactly what sickened people. People on and around the historic New Haven Green near Yale University began falling ill shortly after 8 a.m. Wednesday, and the overdoses continued into Thursday morning. No deaths were reported, and most people brought to hospitals have been discharged, officials said. Symptoms varied. Many victims lost consciousness, officials said. Others vomited. Some just became nauseous or lethargic. An official in the city said Wednesday there were a total of 25 overdoses over a three-hour span and that some overdoses were "in multiples of 4-6 at a time." All of those overdoses were in the area of the New Haven Green, said Rick Fontana, the city's director of emergency operations. City officials said police officers, firefighters and emergency medical personnel will staff a command post on the Green for the time being, and social workers and private health outreach workers will be on hand. Toxicology testing remained incomplete Thursday. Some victims tested positive for the powerful opioid fentanyl, but it appeared most if not all the overdoses were caused only by a potent batch of "K2" synthetic marijuana, said Dr. Kathryn Hawk, an emergency medicine physician and professor at Yale-New Haven Hospital, where many of the victims were treated. Hawk said the people who tested positive may have taken other drugs laced with fentanyl in addition to the synthetic marijuana, which is plant material sprayed with drugs and chemicals. Both drugs, especially fentanyl, have been linked to rising overdoses across the country. Hawk said some people got better with the help of naloxone, an opioid overdose reversal drug, while others didn't. "The most important point is when you buy something on the street, you never know what you're going to get," she said. Officials said three people have been arrested in connection with the overdoses, including a man who may have been giving out free samples of K2. The federal Drug Enforcement Administration tested some of the synthetic marijuana seized in New Haven and did not find fentanyl, said Fontana, the city's emergency operations director. "Yesterday was extremely, extremely busy, something we haven't seen in quite some time, a lot of people dropping all at the same time," Fontana said. He said a few people fell ill Thursday morning, but it wasn't immediately clear if they used the same bad batch of synthetic marijuana. Gov. Dannel P. Malloy said the state departments of Public Health and Mental Health and Addiction Services were helping New Haven officials. He said state health officials delivered 50 doses of naxolone to the city to help replenish its supply. "Today's emergency is deeply troubling and illustrative of the very real and serious threat that illicit street drugs pose to health of individuals," the Democratic governor said in a statement. 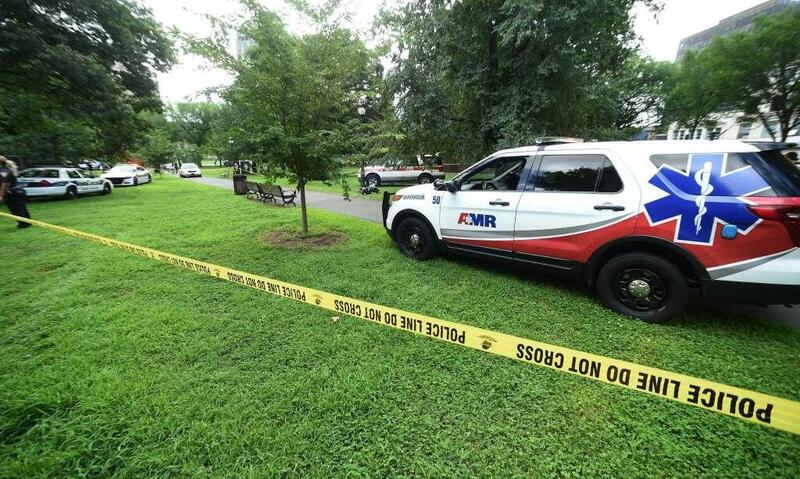 New Haven first responders were called to a similar overdose outbreak on the Green on July 4, when more than a dozen people became sick from synthetic marijuana. The city also saw more than a dozen synthetic marijuana overdoses in late January. No deaths were reported in either outbreak. The state Senate Republican leader, Len Fasano, of North Haven, criticized New Haven officials on Thursday for not addressing drug use on the Green. He said the Green has become "a place of despair" and "no longer an attraction for families or economic development."